As a parent, I am super chilled and definitely a go with the flow Mama but when it comes to the safety of my kids like every parent we are absolutely OTT! So when Spark told us about the launch of the new SPACETALK watch that not only allows you to call your little honeys but you can also track exactly where they are I was like sign me up! I'm all about it LOL. It has incredible technology so that only you and the people you set up can contact them. I want them to wear it for the rest of their lives, I’m not that only Mama thinking that right? Not crazy at all, you're fine. I am honestly amazed at technology these days, especially when it connects me with my babies. Love love love it! A few of the amazing features that first caught my eye were that it has a GPS locator on it where you can see your kids location in real time. Perfect for me while I am out at an event or business meeting it just puts my mind at rest. It would amazing if your little babe is at a friends house or has walked to school and you just want to make sure they are there safely. You can set safe zones for your kids which is perfect for us because the house we are currently renting isn't fully fenced and my biggest fear is them somehow opening the door and running down the drive. But with the SPACETALK watch, I’ve set a safe zone so when they leave that certain area it alerts me! How freaking amazing is that? I've set ours for the top of our driveway. AMAZING. We love the alarm clocks on them too, we have it set for morning and night as a little reminder for them to brush their teeth and it’s so cute when they hear it, you can hear them talking to each other and running off to the bathroom. There's also a set counter which is so cool, its tell them exactly how many steps they've taken and we play a little game to see who can get the most steps, win-win or all of us we get to spend time together playing a little game and also exercising! 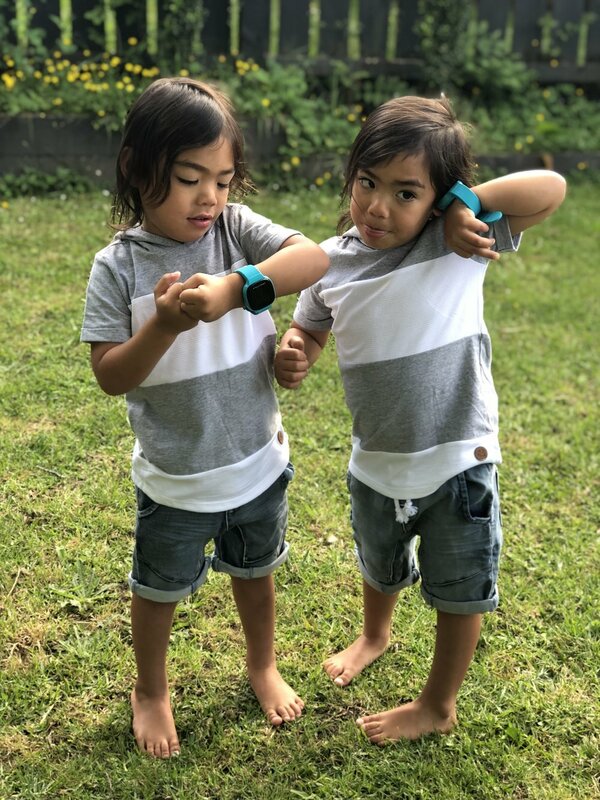 Best part of it all is that you are in control of everything, you can disable and enable features as you please, you make the watch work for you and your children so it's not a distraction but an amazing tool to keep you connected. I love that you can decide when and where they can use them and what they can use them for. There are so many worries as a parent and I love how these eliminate a few of them. The watches are interactive and look really cool too! The boys feel so special with their new watches and take such good care of them. They call each other and it's just the cutest! With Christmas coming this would be the perfect gift, they retail for $399 and the watch also comes with a $7.99 monthly plan. The watch is managed by an app called All My Tribe – which is an additional $6.99 per month. To buy a watch (in pink, teal or grey) head into any Spark store nationwide or go online. You can also pay them off 24 months interest-free, LOVE. 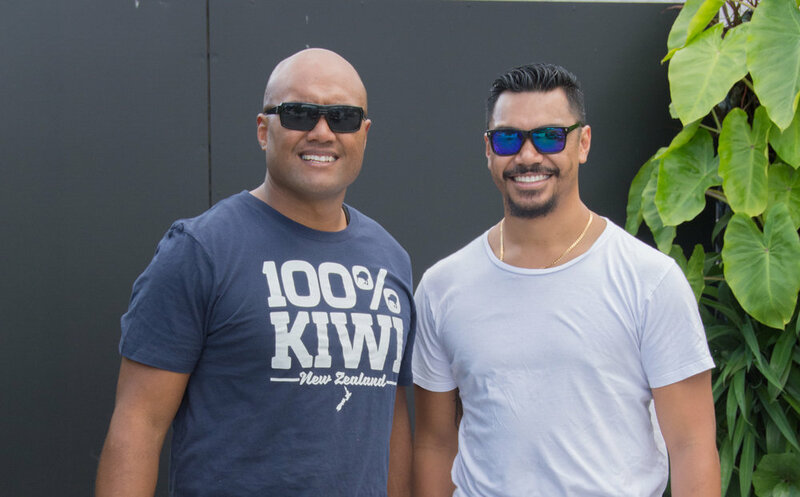 MAMA’S WHO LIVE IN AUCKLAND AND NEED A BREAK YOU NEED TO READ THIS BLOG! Life changing!! Safe T Sleep "ZERO COT DEATHS IN 26 YEARS"
Struggling when it comes to Sleep with your babe? Or are you a parent who is constantly worrying? Then this is a must READ because a Safe T Sleep might just be your answer! Do your little babes love Santa? Thanks to NZ Post they can write him a postcard and he will write back! One of my most highly requested blogs is finally here. Sorry guys it only took me almost 8 months to get done but you know Mum Life LOL. I am so excited to share with you all a few of my "MUST HAVE" essential items that have made that Newborn stage just a little bit easier. BABY SWINGS- these have been and are still a must have for us. Whenever we need to do anything we just pop them in their swing clipped them in and turned on the white noise and away they rocked. About 8 times out of 10 they would fall sleep and still do! The ones we use are Ingenuity from The Baby Factory. Also a little tip they might not like them at first but keep trying they will eventually get use to them and love them. CAPSULE COVERS- Worry no more because these little gems are so amazing. We got our capsule covers from Little and Loco and seriously they were a life saver. We never had to worry about our babes getting swept with wind or rained on, it even kept them safe from all the germy hands wanting to grab and touch them while we were out and about. Trust me you need them! SWADDLES are a huge deal for us! We have always swaddled all of our babies, Hubby is to this day the swaddle king. Hes done a "How to Swaddle your Baby" tutorial on Instagram and the full version is on Youtube. In summer we used the Legs out Swaddle from Global Baby which were amazing because it kept them nice and snug up the top and then their cute little legs were hanging out the bottom. We also used this amazing wraps from Fisher and Price which made them look like little burritos they were a gift so unsure of where they are from but they were definitely my most asked about item. We used normal Muslim wraps you can check out hubby's video here to see how to wrap your baby using them. Our Muslin wraps were purchase from The Baby Factory and Nature Baby and we got the big ones and 6 months on they are still using them. WOOL BABE SLEEPING BAG we got a 3 seasons weight and it is so amazing our little babes are toasty warm even on the coldest nights. I'm so tempted to get a duvet weight one now that its a little bit colder. I think they are an amazing investment, the size you want to go for is 3-24 months because they will last you such a long time. You can buy them from The Sleep Store. BABY MONITOR is a must have! It gives you peace of mind knowing that you can see and hear your baby at anytime. We have the Motorola Digital Video Baby Monitor, MBP36S and we absolutely love it. You can play Music, talk to them through it and see them and zoom in on them and you can even tell the temperature in the room. We got ours on sale at Farmers. What were your go to Essential Newborn Items? Enjoy those cuddles Mamas they grow up so fast. 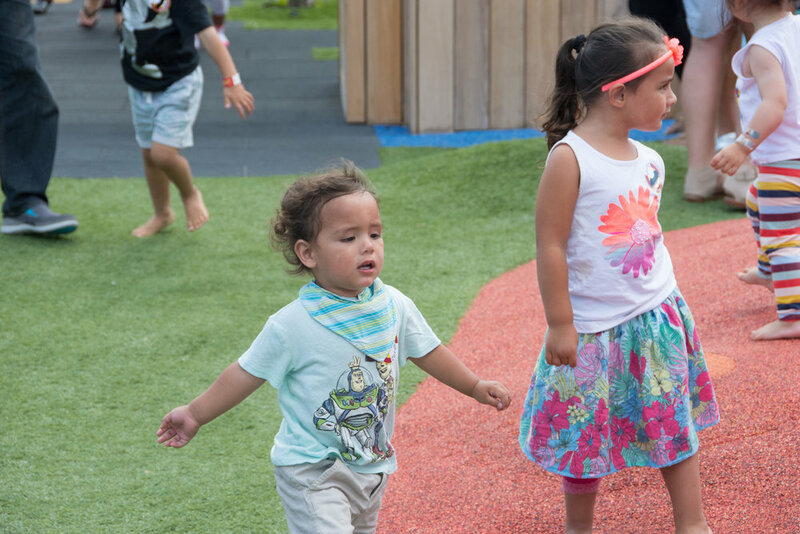 On the weekend we had the opportunity to take our kiddies on a little adventure to Whoa studios in Henderson, Auckland. 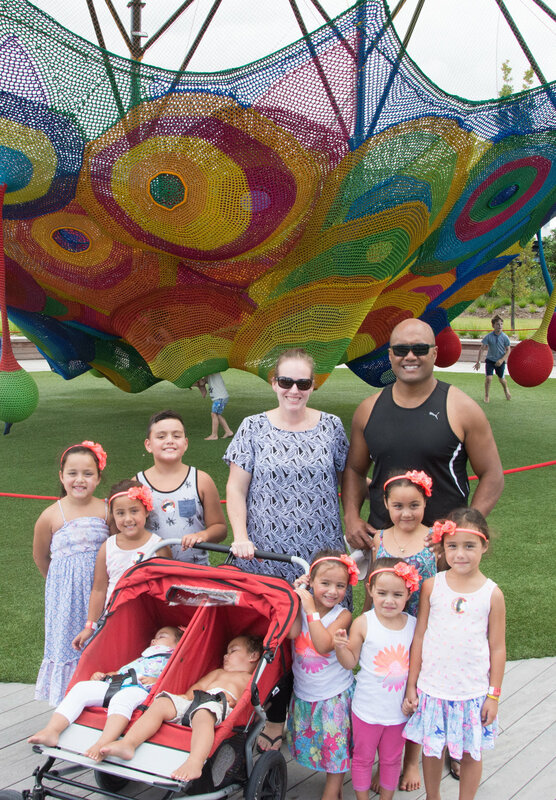 We went with our amazing friends "The Uhila Collective who have four sets of twins plus one. You can keep up to date with them by following them on Facebook and Instagram @theuhilacollective . Between our two families we had 14 children as my 11 year old brother came to. Can someone please award us a medal. When we arrived, there was a car park but it was packed and we had to park down a side street. We took a short stroll and there we were. As you walk in there is beautiful greenery everywhere (perfect place to get a photo for the gram). The vibe as we walked in was awesome, the colorful play grounds were vibrant filled with children of all ages running around, parents watching on having the best time. I loved that there were staff members scattered around the playgrounds keeping an eye on things and keeping the place tidy. We by passed the playgrounds and went straight inside as we had booked in to see "The Doods Dance Show" it is an interactive show with a cross between the Muppets and Despicable me (so pretty freaking awesome as our boys love Despicable me). In our usual style we were running a little late but got to catch most of the show. The show was amazing, lots of interesting characters, heaps of dancing and there was a projector screen so every could sing along. All of our kids had a ball laughing, dancing and singing and seemed pretty amazed at the whole show. Harlow and Noah stayed fast asleep in our arms with not a care in the world and not a clue about what was going on around them. Thank you Babies! Once the show was finished we were lucky enough to all have VIP passes and go backstage which was pretty cool. The writer and director of the show showed us all of the incredible props and artwork they used to make the show the detail on everything is mindblowing. I highly recommend doing this if you have older children my little brother Levi who is 11 couldn't stop raving about it when we left. It was amazing to see how much time and effort actually went in to making the show what it was. We also got to meet some of the cast and have photos to which some of the kiddies loved and some not so much. Wohoo! Time for the Park. There were two parts to it one was the Mesh Playground which is a massive climbing net, it is brightly colored and so beautifully designed you have to see it for yourself. The other was the Adventure playground which had a Rocket Ship and Mission Control, the Dragons Castle and the Pirates Cove and best of all they are all Movie Set Quality. We arrived at 11am and didn't leave till 3.30pm so you can imagine the fun that was had. It was all so well designed that we didn't have to run around after all the kids or worry about where they were. Us four adults even got to relax and enjoy a coffee, what a miracle! Would I recommend going there? Yes 100%, it is such an amazing day out for families of all ages. They have everything you need on site. If you want food there is an eatery called The grounds which has an amazing menu decked out with lots of fresh and decadent food and fresh pressed juices. We decided that we wouldn't eat there because you can imagine it would have cost a small fortune and maybe a set of twins to feed 14 people! One thing I did love is that you can have a glass of wine while watching your kids play, next time I go that's me! They ask that you don't bring your own food onto the premises but you are able to take snacks in for 2 year olds and under. 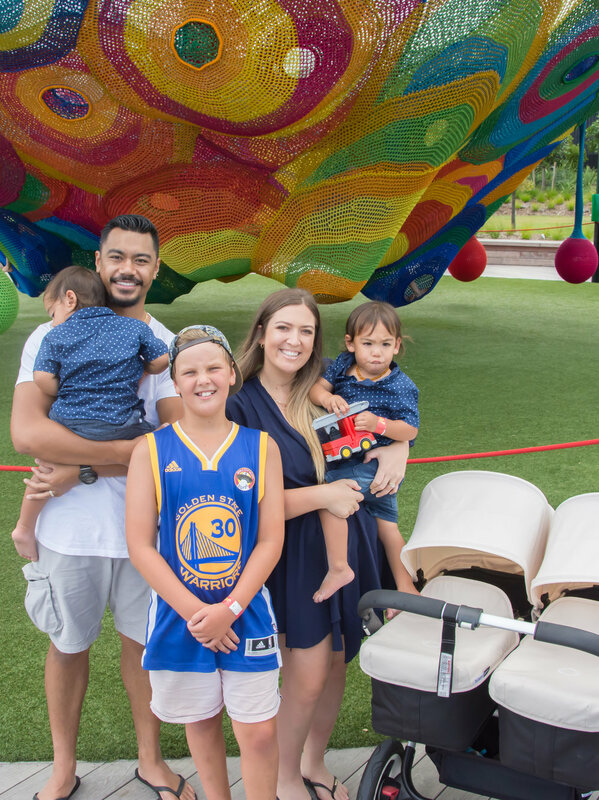 You definitely need to go and check it out for yourselves, we had a great time and so did all of our kids they absolutely loved it, from the moment they stepped foot on the playground that was them for the day. The facilities are beautiful and brand new and so well maintained, all the staff are all really friendly and helpful and everything is kept nice, clean and green. Thanks for having us Whoa Studios we will be back again for sure. You can follow @whoastudios on Instagram and Facebook to keep up to date with events and shows. Here is a link to their website https://whoastudios.co.nz/ for all pricing and other information. I needed to write about the beautiful space that was created for our little babes by my lovely friend Ness AKA OMG-Ness Styling (insert every party emoji ever created) THANK YOU THANK YOU THANK YOU. When I decided I wanted to do up a cute little nursery for our babes I knew I didn't have the time nor patience so that's when I called in Ness so she could put her magic touch on everything. This gal can literally turn your styling and Interior decorating dreams into a reality. Be sure to follow her on Facebook and Instagram for everything styling and check out her website to see all of her amazing services shes offers. 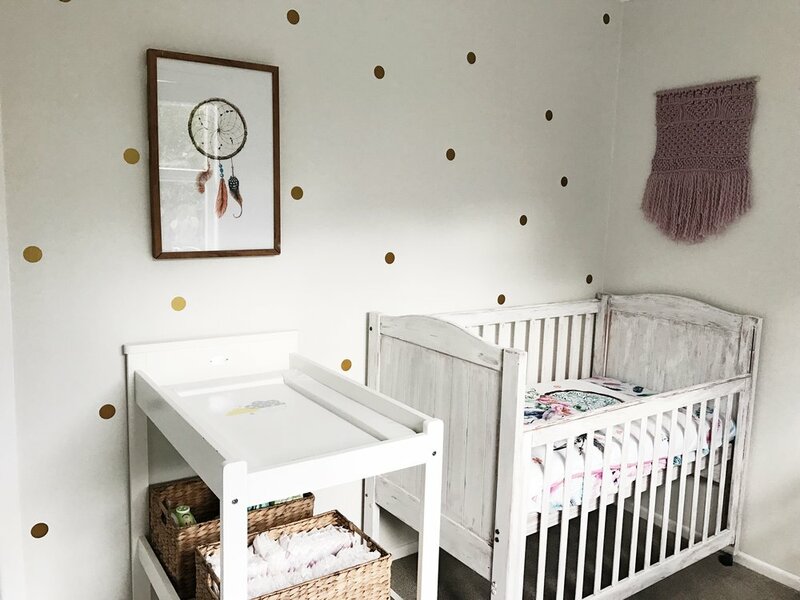 When deciding on a theme and an overall feel for the room I knew I wanted to keep it really simple with nice, natural with neutral tones but a slight pop of color to give the babies a bit of individual style and flair. It was also really important to me to work with lots of small businesses especially Kiwi Owned and Operated as I love to support local. So here is a list of all the incredible businesses we collaborated with to make Harlow and Noah's Nursery happen. Poppy Cotton provided us with the most BEAUTIFUL bedding I have ever seen. I seriously need to invest in a Super King Duvet for our bed because that is how amazing their stuff is. We decided to go with the Pink Feather fitted sheet for Harlow and the Blue matching Feather fitted sheet for Noah. It was a really hard decision on what to choose for the quilt as there are so many designs that we loved but we decided on Matching Dream Catchers for our babes, Harlow got the Pink version and Noah got the Blue and Grey version these also came with a matching toddler pillow case each. The detailing and color is unreal, make sure you go and follow Poppy Cotton on Facebook and Instagram and be sure to check out their website for some amazing products. We still had Henry and Theo's old cots which have so much sentimental value to them that we knew we had to use them. Ness had the amazing idea to up cycle them so we got the amazing Mother/Daughter team Made By Love in to work their magic. They work with Annie Sloan one of the best products on the market which is non toxic and safe for our little babes, it dried within 20 minutes and doesn't have any odor which is amazing. 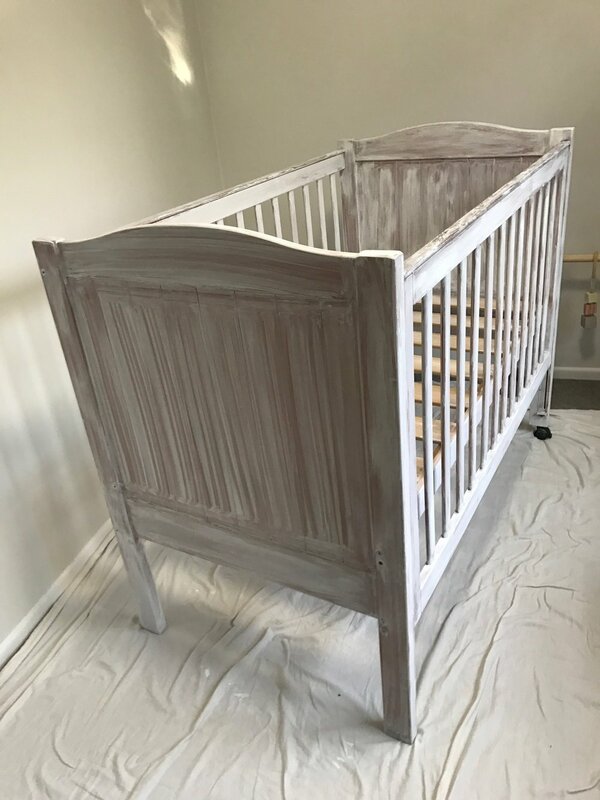 Our cots were painted with so much love and care and the final White Wash finish was incredible, they are definitely the stand out pieces in the nursery and we absolutely love them. Be sure to follow them on Instagram and check out their website for their one off bespoke pieces. Black Sands Furniture came through with the most amazing custom made Twin Play Gym. It was the first they had ever made and let me tell you it is beautiful. I love that they use all Eco friendly materials and the fact that it came with play gym toys attached to it. The babies love hanging out together playing with their wooden gym toys and when they aren't playing with it, it easily folds up so we can store it away. Be sure to follow them on Facebook and Instagram and check out their website for all more Decor, Indoor and Outdoor Furniture. 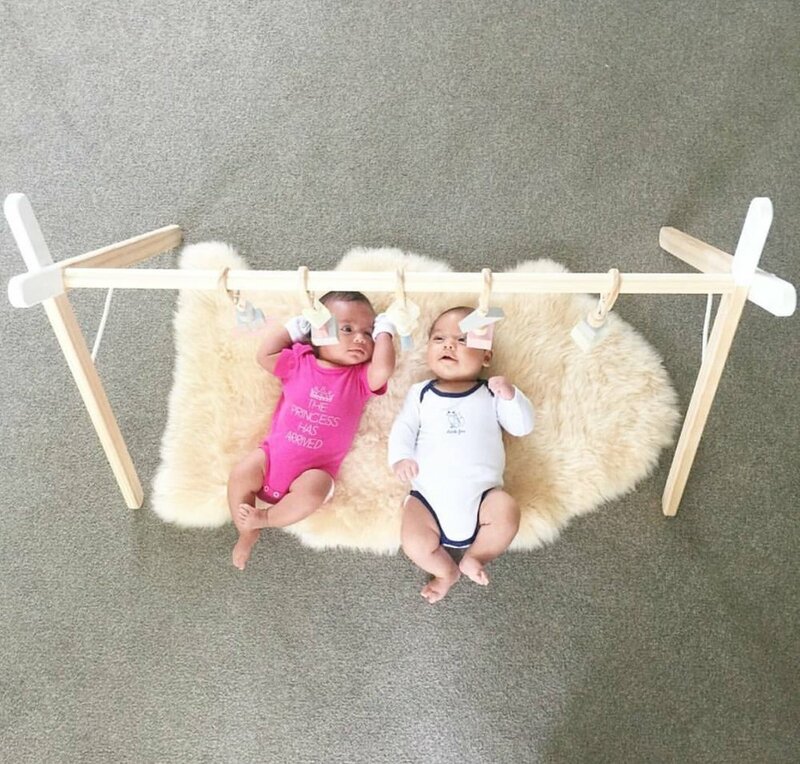 Our custom made Woolen Macrame pieces named "Harlow" and "Noah" especially made by their talented Aunty Ruby who is the founder and creator behind Made By Ruby Lee. These are definitely statement pieces because of the intricate work and detail. Be sure to follow Made By Ruby Lee on Instagram to keep up with all of her custom made Macrame and Jewelry pieces. 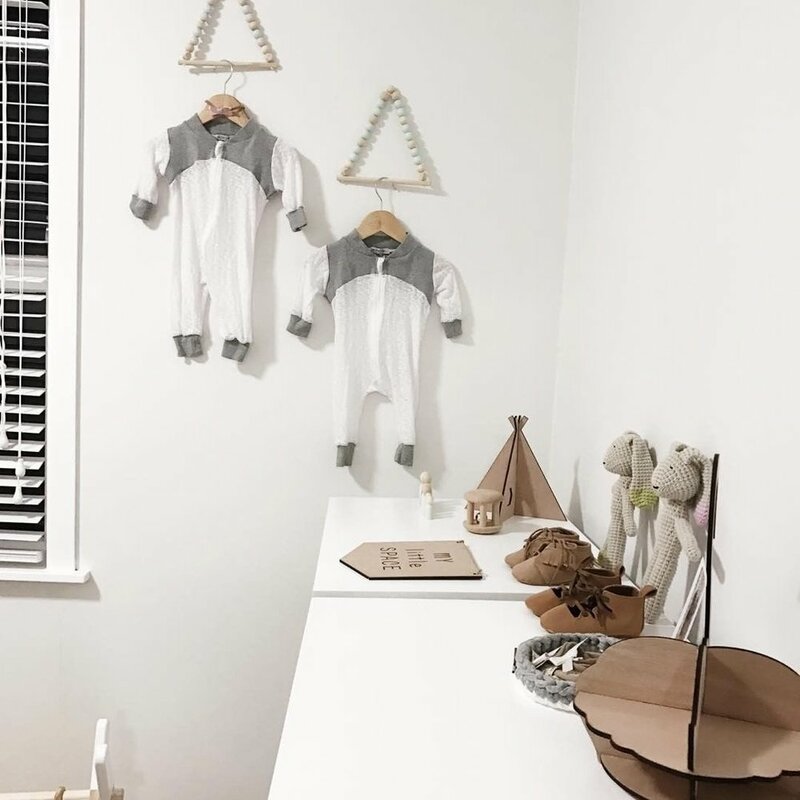 Little Koha also sent us one of their Boutique gift parcels called "The Baby's Room" which was package so beautifully and contained a set of wooden counting blocks, a wooden and feather wall hanging, a white and grey felt garland and a A5 geometric bunny print. Make sure to follow them on Facebook and Instagram and check out their website for more amazing Gift Parcels. Little Love Bundle made us some beautiful custom made hanging wardrobes to hang a special little outfit on, we also had a custom peg family made in specific colors and a set of custom coloured nesting dolls. Make sure you follow them on Instagram and Facebook to check out what they have been making and head to their website to see all their nursery decor and teething products. My Little Space who was started by two amazing Mamas made us one of their signature "My Little Space" signs, a Wooden Tee Pee for Noah and a Swan display shelf for Harlow which we love. You can follow them on Facebook and Instagram and check out their website for more kids decor. Once Upon a Whim made Harlow and Noah the most gorgeous crochet Bunnies and a perfect little crochet basket to hold all of our Princesses headbands. Make sure you follow them on Facebook and Instagram and check out their website for more Modern Crochet items. We also used some Gold circle wall decals from Mimosa Design who you can follow on Facebook and Instagram. You can also check out their website for lots of fab products for you and your baby. 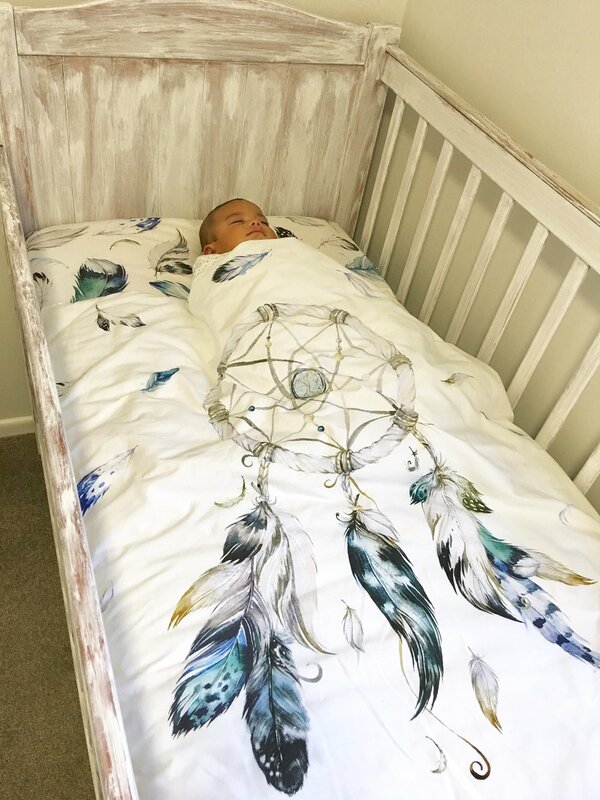 Our drawers are from Victors Furniture and our change table is from Trade me, the framed dream catcher print is from Farmers. Everything else you see in the room is from good old Kmart. I hope you enjoyed looking at all the beautiful pictures of our little babies nursery and hopefully you have discovered some new products that you will love just as much as we do. After 9 long exhausting months you finally get to meet your little bundle of joy or in our case bundles of joy and of course everyone is so excited to meet and see them. This is all absolutely amazing and so wanted but here are a few things Hubby and I came up with that were really important to us when Henry and Theo were first born. I thought this was one just common knowledge but after the horror stories I've been told obviously it isn't. NEVER and I repeat never announce the arrival of someone else's offspring on social media, if they haven't posted anything then just wait until they do. If you want to visit always text and organise a time, don't just turn up. Birthing a baby is exhausting and looking after them is even more tiring so unexpected visitors are always overwhelming and stressful. Be considerate and wash your hands as soon as you arrive. Some people are more pedantic than others but this is just a nice gesture to the parents and it shows your are fully ready for cuddles. If you want to take pictures make sure it's alright with Mum and Dad first and if you want to post them on social media always ask permission. If you are a smoker don't smoke right before you come over and don't smoke when you are over either. Smoking anywhere near or around new babies is the worst thing ever, even just having stale smoke is yuck and its awkward for some people to say no. Don't ask if they want any food just bring it! (Maybe just ask about dietary requirements) It will so be appreciated and you will be the best thing since sliced bread. The last thing you are thinking about with a newborn is feeding yourself so food is definitely a lifesaver especially when you don't have to prepare it. Something that can be heated up or quickly made it the best. Kisses and cuddles are so welcome and so important but please don't kiss them on the lips and don't put fingers in their mouth to soothe them it's just gross. Last but not least make it short and sweet. Don't go over and stay for hours unless it's requested. Come over have cuddles, have a cuppa, offer to put a load of washing on, do the dishes or when holding baby even ask them if they want to have a nap and get some rest. There is seriously nothing worse than having people stay for hours on end when you are exhausted and just want to sleep and especially if you haven't bought food and they end up cooking for you! This all sounds pretty intense but having a new baby is intense in itself and without all the added pressure these little things will be so appreciated by any new parents.